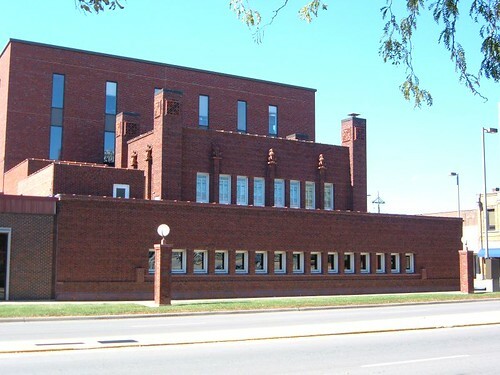 A Chicago Tribune blog reports that Louis Sullivan’s Peoples Savings Bank in Cedar Rapids, Iowa has sustained an unknown amount of flood damage, with several feet of water entering the bank. The bank is one of a series of late-career works by Sullivan, scattered across the Midwest; it is currently a Wells Fargo location. I visited it in 2004, but was unable to go inside as my visit occurred on a weekend. It’s less than a block away from the river which runs through the center of town. At least one Flickrite has a photo of the floodwaters surrounding the bank. The bank is far from the only architectural victim of the floods; much of the city’s old downtown is reported to have sustained damage. This entry was posted in Endangered Buildings, Louis Sullivan, Preservation & Renovation. Bookmark the permalink.